So what exactly happened? They scanned the package Monday morning at the Concord distribution center, and someone (or something) made the executive decision that because it was “not due for delivery” it didn’t need to go out on a truck that day. So it got scanned again, sat all day in a big pile of packages (probably also “not due for delivery” yet), and then got scanned again at 9pm, clearly just to taunt me with its “Ha Ha, I’m still not in your house” status. Did the package NEED to be delivered on Monday? Probably not. But it seems a little unfriendly to have some sort of corporate policy that says packages “not due for delivery” should be held at a shipping facility until they ARE due, rather than sending them out whenever they are available to go out. Maybe the driver for my route wanted to knock off early and decided to push it back a day. Or maybe FedEx knows that gas prices are cheaper on Tuesdays, and wanted to hold off all available packages an extra day? Whatever the reason, the end result is an impression of not seeming to care about the end-user. 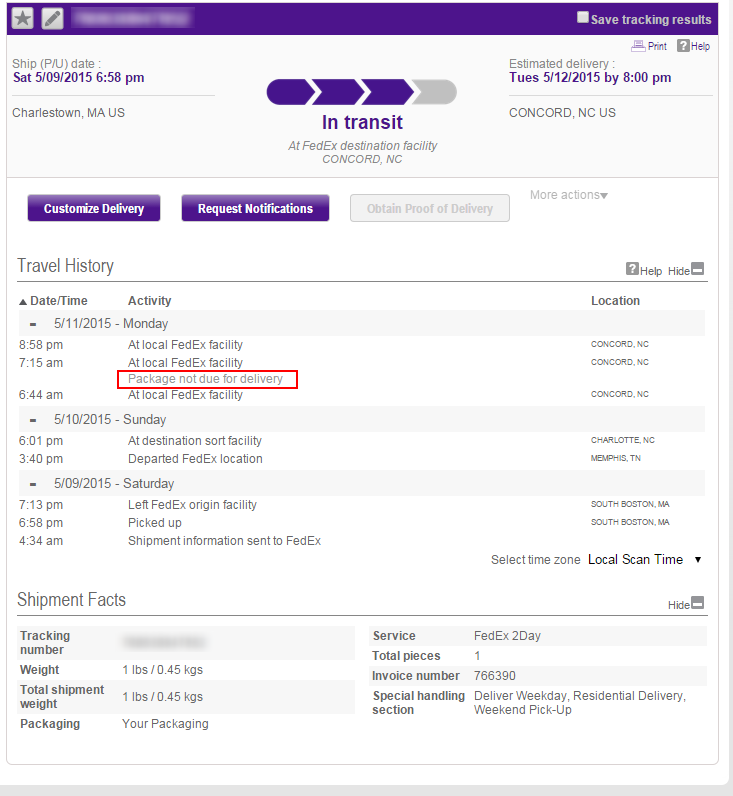 So good luck to you, FedEx. I hope you make some other person out there really happy by delivering their package a day early, but it won’t be me – I’m headed back to UPS for my future shipping services.